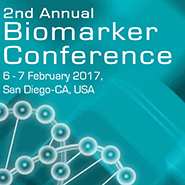 On 6-7 February 2017, San Diego (CA), will host three MnM annual conferences on Genome Editing and Engineering, Biomarkers, and NGS Data Analysis and Informatics. Genome editing holds the promise of a breakthrough in the area of pharmaceutical science, since the discovery of the CRISPR/Cas systems. The conference brings together the key industry leaders and researchers to address the concepts, challenges & applications of the genome editing tools like CRISPR/Cas9, TALENs. 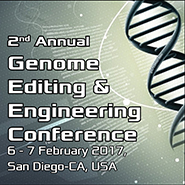 Case studies and sessions will reveal the potential application of genome editing tools from the modern biomedical & therapeutic applications. Special emphasis on CRISPR system addressing the concept, technology, challenges like integration of genome, off-target effects, and delivery systems. Go to the conference website to learn more about the details of the upcoming conference. Key highlights includes: translational medicine and biomarkers, NGS and circulating biomarkers, biomarkers in Immuno-Oncology, liquid biopsies etc. Read more on the conference website. Next -generation sequencing (NGS) technology revolution has brought influx of large-scale data where storage and management, processing and integration, validation for quality, has become a challenge in biomedical industry. FDA and other regulatory bodies have been working to develop a regulatory framework for NGS applications in various fields based on validated analytical standards that would ensure that NGS tests produce accurate and reliable results. 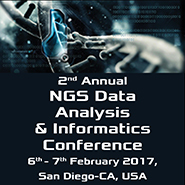 In order to find answers to biomedical questions ranging from evolutionary heritage to the functioning of cellular molecular machinery and address the challenges faced, NGS data analysis and bioinformatics solutions has to be discussed among all the stakeholders. Visit the conference website to learn more and register. We will send a discount code for 20% off the registration fees in the DNAdigest newsletter soon.